Listening to “With Arms Wide Open” by Creed is an emotional and uplifting experience. The music is electrifying and the lyrics touch the deepest level of a person’s true feelings. It is virtually impossible not to be affected by this classic rock band’s music, as its message crosses over all genres of music creating a timeless message all can hear. It is fascinating that Creed has a “God” message, but they have never been categorized as a Christian band per-se’. One of the most prolific and classic rock bands in American history, Creed endured a devastating break-up in 2002, only to return triumphant with countless platinum records and successful tours. TTW is proud to tell the story of one of the greatest rock bands that has ever graced our ears and uplifted our hearts and souls. In a world riddled with mediocrity, false drama and a lack of integrity, one would have to pause and consider why this great group has survived the milieu of minefields in the industry and the public eye. One must ask themselves how and why could this happen: From a divine perspective, possibly it might just be the message itself! But to truly understand the dynamics we need to look at some amazing history of a band aptly named: CREED. The American rock band Creed was formed in 1993 in Tallahassee, Florida by lead vocalist Scott Stapp, guitarist and vocalist Mark Tremonti, bassist Brian Marshall and drummer Scott Phillips. Creed released two studio albums, “My Own Prison” and “Human Clay” in 1999 before Marshall left the band in 2000 to be replaced by touring bassist Brett Hestla. The band went on to make a third record in 2001 entitled, “Weathered,” which seemed to manifest a self-fulfilling prophecy of “weathered” relationships; eventually leading to the band breaking up in 2004. But nothing could keep this type of talent quiet or stop their message from continuing. 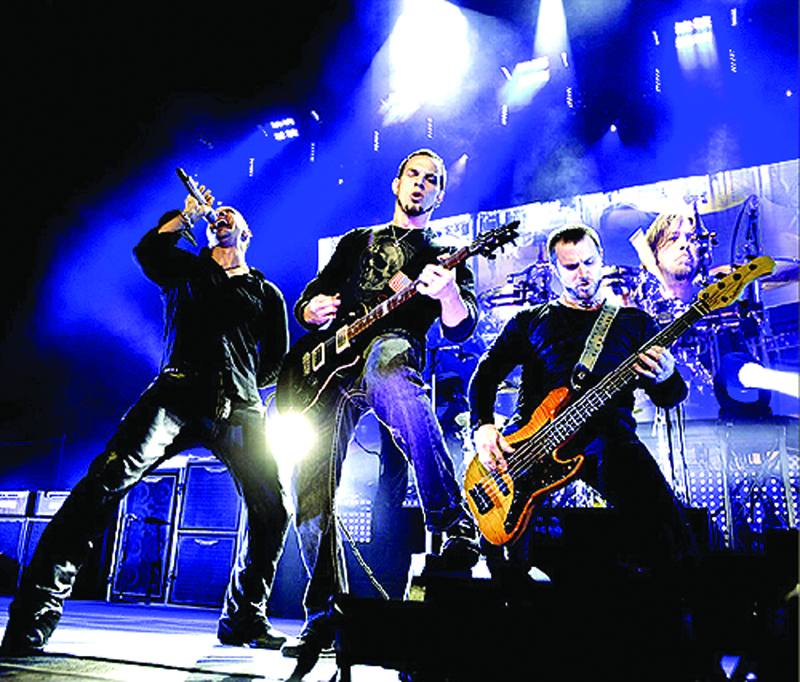 In 2009 the mega band Creed reunited for a tour and the creation of their new album “Full Circle.” Stapp commented on the album’s theme: “It really defines and articulates, melody- wise and lyrically, what’s happened with us. We’ve come full circle and it’s a great place to be!” In 2009 Creed performed a live concert in Houston, Texas. It was recorded and then released as a live internet stream broadcast on Dec. 8, 2010 as the concert, “Creed Live,” which was the band’s first live recording. The performance also featured the first usage of the “big freeze” technology, which was popularized by “The Matrix,” then utilized by Creed in a concert environment! The performance broke four world records including the use of the most CAMERAS- a title previously held by Justin Timberlake! In 2012 the legendary band continued to reconnect to start a major tour and begin their fifth album. The history and evolution of the band Creed creates fascinating reading and a study in history. Creed became enormously popular in the late 1990’s and early 2000’s, releasing three consecutive platinum albums. Their second album “Human Clay” was released in 1999 by Wind-Up Records and went on to be certified “Diamond” by The RIAA, ranking 54 on the top 100 selling albums of all time in the US! “Full Circle” was the band’s first number 1 hit, staying on top for two weeks as it took its rightly place in history as the 8th best-selling album in the US in the last 20 years! As of May 2012, “Full Circle” has sold 11,579,000 copies in the US alone. (According to Soundscan numbers) It has also been certified Platinum six times in Canada, 5 times in Australia, 7 times in New Zealand and 4 times in Switzerland, selling an estimated 20 million copies world-wide! “Human Clay” was ranked #5 on Billboard’s 200 albums of the decade, for 2009. According to Mike Tremonti, the album cover represents a crossroad where every man finds himself: “Our actions- what we are… is up to us- we lead our own path and make our own destiny.” The title in the album comes from a lyric in “Say I” (The dust has finally settled on the field of human clay) from a song that carries the same message. Their fourth single, “With Arms Wide Open,” won a Grammy for Best Rock Song. The album had three released videos:” Higher;” “What If,” and “With Arms Wide Open.” “Arms Wide Open” was voted 92nd best video of all time by VH1 and ranked #4 on the “25 Power ballads.” VH1 listed “Higher” as one of the greatest rock songs of all time in 2009. “Human Clay” is the only Creed album that does not have a title song, and yet went on to win awards and sell millions of records. I can’t help but think that Creed is experiencing some divine intervention at this moment! We all have a lot to learn from the personal journey of one of the greatest rock bands in history. Fame is intoxicating and can be a deal breaker for most relationships. But, in the end, the lyrical message of Creed became their reality as they proceeded with a world tour and the making of their fifth studio album in 2012. However, the mystery continues and as of Sept. 2013, the press has heard NO new news on the continuing and dramatic saga of Creed or the album. As for TTW- well, no news is good news to us! We can continue to dream and will continue to applaud the brilliance of Creed and keep our readers posted on any new up-dates. In 2011, Billboard ranked Creed as the 18th best artist of the 2000s. If this IS divine intervention, then we would hope to see all of these accolades and blessings carry them forward into 2014 and beyond. If not? Then the public around the world will continue to be blessed by the music of one of the greatest rock bands of all time. You can take the music out of the business, but you can never take the music out of our hearts! TTW salutes Creed and gratefully acknowledges one of the greatest rock bands in American history. May God bless us all and may God bless Creed!